Home > My opinions > Skincare > Equilibra Dermo Oil – My Cosmetic of All Time! Equilibra Dermo Oil – My Cosmetic of All Time! I don’t usually use nourishing oils, but I got temped by an article in a magazine to buy Dermo Oil Multi-Active. I read opinions online and as it turns out it is extremely valued and universal natural oil for skin nourishment. And you know what? I cannot live without it, that is truly my favourite cosmetic of all time! Equilibra Demo Oil Multi-Active has a 100ml bottle made out of quite soft plastic. Pink packaging with white top contains oil made of natural ingredients with an interesting formula. Dermo Oil has greasy, oily consistency, but at the same time has more of lightweight formula than other body oils. Big plus is also great and pleasurable scent, sweet and a bit almond like. It is one of those products, which I love to smell before application. Vitamin E for even skin tone. I admit, I like universal oil from Equilibra. Manufacturer ensures that it works on five of the most common skin problems: scars, stretch marks, dryness, discolouration and first signs of ageing. I may not have stretch marks, but few smaller scars really disappeared after first week of use of this oil. Honestly, I didn’t even think about application of Dermo Oil Multi-Active as a scar product – it just happened, so I was positively surprised. Sadly, I can’t judge rejuvenating properties of oil, because I don’t have any signs of ageing yet (luckily!). I cared about elimination of dry skin and discolourations. Since I remember I had problems with my skin, it was highly atopic and sensitive. Multiple times I felt effects of dry skin, flaking epidermis and redness. 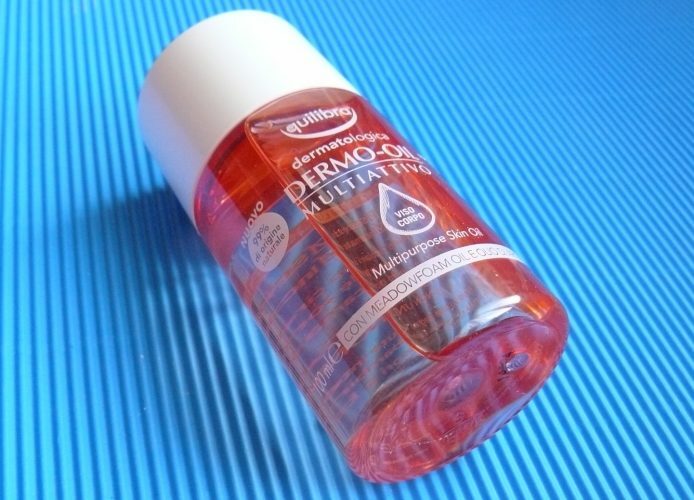 In this moment I should thank the manufacturer of Dermo Oil Multi-Active! Equilibra oil is truly very subtle and safe for skin product. It doesn’t cause irritations (like other cosmetics did), and even soothed my skin, which gained deep moisturise and equal, healthy colour. Best thing is that the effect is extremely long lasting! Layering – Why and How do I Use it? How to fix greasy hair? My 1001 applications of L’oreal Paris Nutri-Gold Extraordinary Oil. The three Boosters from Clarins: Repair, Detox and Energy. rome on Why am I in love with the Nanolash Serum? anna2 on Why am I in love with the Nanolash Serum? Samina on Why am I in love with the Nanolash Serum? harj1882 on Why am I in love with the Nanolash Serum? Beautyou equals women and cosmetics Copyright © 2019.